The sandstone quarries at Aquia Creek, just up from Aquia Landing at Brent Point, were the source of the building stone used in the construction of many well-known buildings, such as the Capitol and the White House, as well as buildings at Woodstock, George Brent’s plantation on Aquia Creek, and the Brent tombstones at the Aquia cemetery. About 1646-47 Giles Brent came from Maryland and settled on Aquia Creek and in 1650 quarrying was begun. The Aquia sandstone, also known as freestone in colonial times, was a reddish color. The sandstone was used at Gunston Hall, home of George Mason IV whose second wife was Sarah Brent (c.1730-1806), daughter of George Brent and Catherine Trimingham. 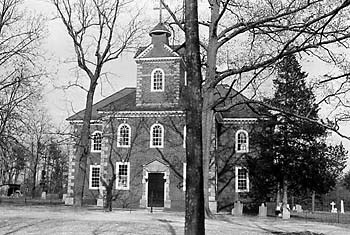 It was used for the stone steps and walkways of Mount Vernon, for the old Aquia Church, and for Christ Church in Alexandria. A 1694 deed shows that George Brent, nephew of Giles, “hast purchased a small tongue of neck or Island of Land with small point of marsh…” and after this time it was known as Brent’s Point. 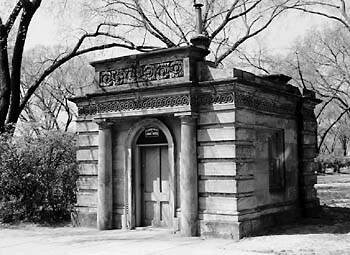 Except for one acre of this land, which was sold in 1786, to a stonemason by the name of Robert Steuart, the quarry remained in the possession of the Woodstock Brent family for nearly one hundred years. On 2 December 1791, George Brent (1760-1803), son of Robert Brent and Ann Carroll, sold the quarry to Pierre L’Enfant for £1800 (about $6000). L’Enfant had been hired to design and plan the new seat of government, the District of Columbia, and he chose to use the sandstone from the Aquia quarry. The quarry became known as Public Quarry and the island (actually a peninsula) became known as Government Island. (It was also known as Wiggington Island for reasons unknown). Forty boundary stones, made of Aquia freestone, originally marked the four sides of the diamond-shaped square of the District of Columbia, North, South, East and West. The stones were square with a pyramid shape at the top and were laid out, each stone a mile apart, by Benjamin Banneker and Major Andrew Ellicott between 1791 and 1792. On the sides facing the states, the names of the states were inscribed. On the opposite side were the words "Jurisdiction of the United States." These boundary stones are the oldest federal monuments in the United States. The White House was built using Aquia sandstone but the stone was painted white. After the War of 1812, when the White House was burned, the structure was washed and cleaned but more of the Aquia freestone was brought in to restore the building. Parts of the Capitol building are built with Aquia sandstone including the original gatehouses which can now be found at Constitution Ave and 15th and 17th Streets in Washington. The stone is unpainted and the original color can be seen. The sandstone was also used for one portion of the National Portrait Gallery as well as the original Treasury and Patent buildings. The Old Cape Henry Lighthouse in Virginia was built with the sandstone from Aquia. This lighthouse has been called the first U.S. lighthouse in that it was commissioned at the first session of Congress and paid for by the federal government. (The first lighthouse in America was built in Boston in 1716). The quarry was closed and reopened several times with the Ford Motor Company owning it for a time. The quarry fell into total disuse about the time of World War II. It is presently owned by Stafford County and the National Capitol Area Council of the Boy Scouts of America. A form has been filed to put Government Island on the list of National Historic Places. Photograph of Aquia Church, U.S. Route 1 & State Route 676, Stafford vicinity, Stafford County, VA. Historic American Buildings Survey, Library of Congress Prints and Photographic Collection, Washington DC. Photograph of the U.S. Capitol Gatehouses, Fifteenth & Seventeenth Streets at Constitution Avenue, Washington DC. Historic American Buildings Survey, Library of Congress Prints and Photographic Collection, Washington DC. 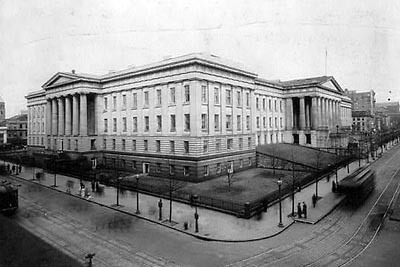 Photograph of the old U.S. Patent Office Building, Washington DC. National Photo Company Collection, Library of Congress Prints and Photographic Collection, Washington DC. Brent, Chester Horton. Descendants of Coll Giles Brent, Captain George Brent and Robert Brent, Gentlemen, Immigrants to Maryland and Virginia. Rutland, Vermont, Tuttle Publishing Co., 1946. Eby, Jerrilyn. They Called Stafford Home: The Development of Stafford Co., Virginia from 1600 until 1865. Bowie, MD, Heritage Books, 1997. "Historic Aquia Sandstone Site soon to be a park site."